Amerisleep is no stranger to the mattress industry. In fact, the company has been in the business for about a decade. After years of planning and building its brand through quality products, Amerisleep decided it was time to open a showroom and redesign its mattress line, in addition to a total brand overhaul. This week, I had the opportunity to go check out Amerisleep’s first ever showroom in Gilbert, Arizona, which opened its doors on June 17, 2017. Amerisleep was also featuring its newly revamped mattress line in the showroom, so I had the chance to lie on each of the company’s new mattresses for a few minutes. My initial thought as I entered the Amerisleep showroom…wow! Amerisleep created a modern-looking showroom with a homey feel. Combining these two traits is not always easy, but Amerisleep has gone above and beyond with this project. While a vast majority of mattress purchases are still made in stores, Amerisleep’s space is as much of an experience as it is a showroom. 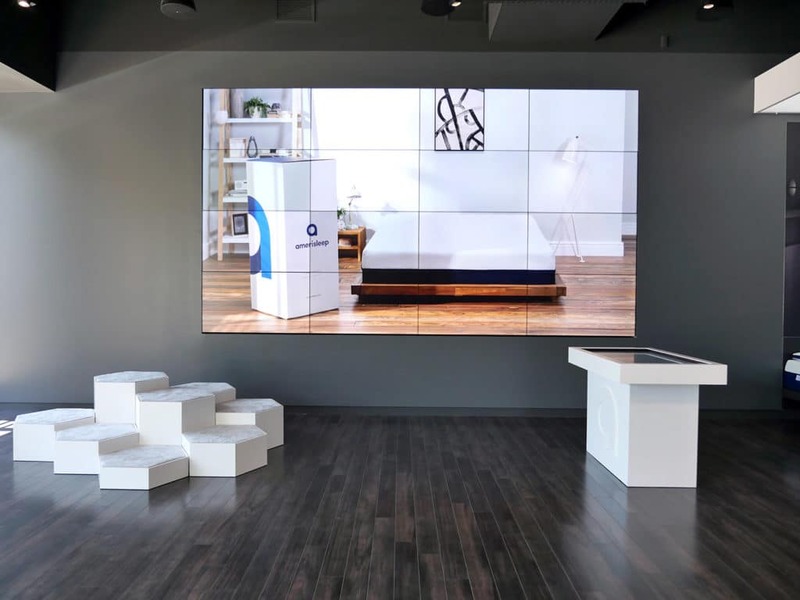 Amerisleep wants its customers to be able to come in, lie on a mattress to discover which feel is best for them, and leave without the pressures often associated with more traditional mattress stores. There are no pushy salesmen, just an Amerisleep representative who is there to help answer any questions. The use of technology in Amerisleep’s showroom is quite cool. 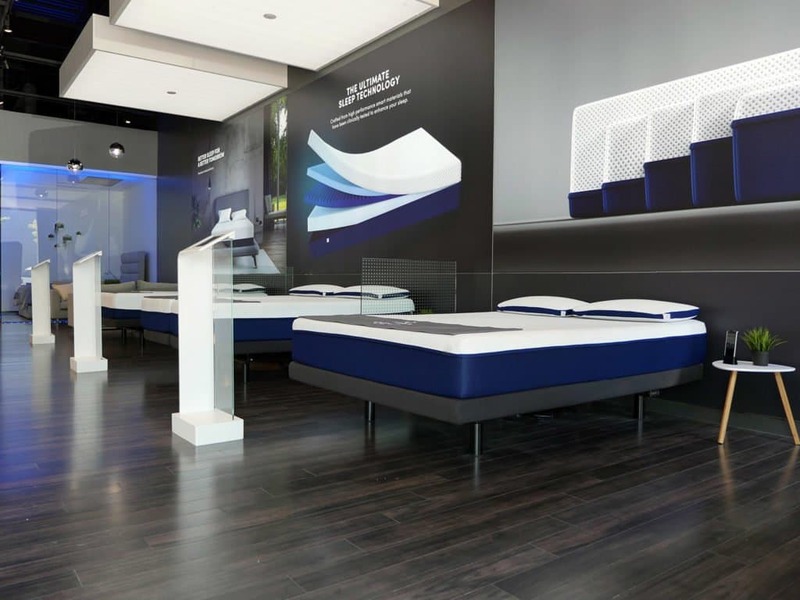 At the foot of each mattress is a tablet that allows shoppers to have an interactive experience with the mattress they just laid on. Once the tablet is touched, it offers the customers a more in-depth overview of the mattress, including breaking down the materials and why Amerisleep chose each material. The same technology is also used to break down the new Amerisleep pillow and sheets. Yet instead of a tablet, the pillow and sheet tables have two large touchscreen monitors placed within the actual table itself. Another interesting element was the showroom’s interactive TV wall. When you walk into the store, there is a large screen to your left that is mainly used to display Amerisleep promo videos. However, it can also be used by an Amerisleep employee to show specific videos about their mattresses. The employee simply uses the free-standing computer table to look up the preferred video and it will then be shown on the wall. To add a bit of fun to the mix, Amerisleep allows consumers to use this computer table as well. Anyone can walk up and use the table without projecting it to the wall. On the table customers are able to learn more about Amerisleep and their products. Amerisleep wanted to offer customers the chance to sleep on its mattresses in the store, so it built in two private nap pods. These nap pods each feature a different, fully dressed Amerisleep mattress (mattress, sheets, pillows, comforter). Once a customer walks into the virtually soundproof room, sensors under the mattress create the experience. A television in the ceiling allows the consumer to lie down and look straight up at a multitude of relaxing displays. These displays are also connected to the lighting of the room. For example, while images of nighttime are shown on the TV screen, the lights in the room will be various hues of blue, resembling nighttime and sleep. After 4 minutes, a brighter image will appear on the TV, resembling a sunrise, which will also trigger the lights to change to reds and yellows. 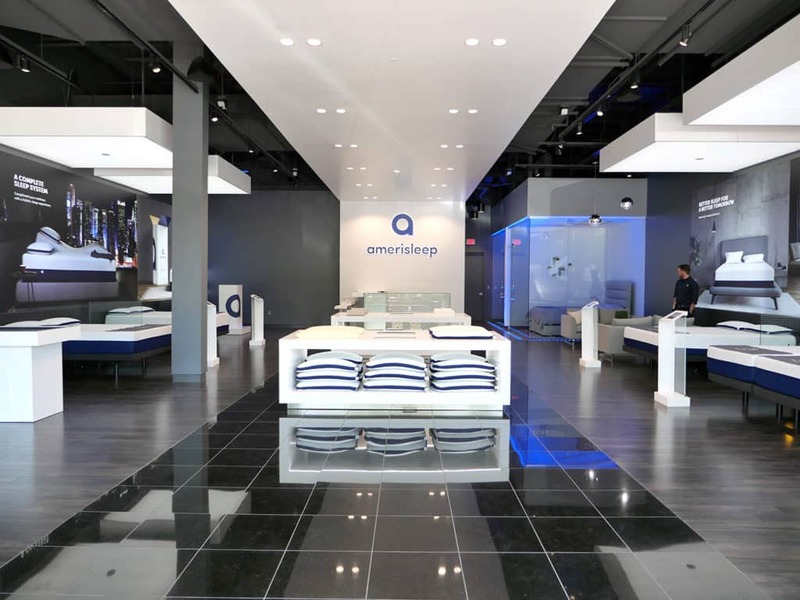 The timing of the showroom’s grand opening also coinciding with Amerisleep’s launch of their updated mattress line. A new cover, slightly different feels, new names, and some material changes all came together to help produce these new mattresses. Although I was only able to lie on each mattress for a brief period of time, I will say that Amerisleep certainly took its mattress line to a new level. Each mattress cover now contains Celliant fibers, which help to improve blood flow throughout your body, resulting in faster recovery times, less pains and aches, and better oxygenation. FAQ: What is Celliant Fiber? A cover has to be more than just aesthetics. It’s all about the relationship the cover is going to create with the sleeper once their body hits the mattress. Which is why we [Amerisleep] spent so much time developing our new cover. Firmness on each of the new mattresses felt close to the original line, but the support, pressure relief, and overall comfort have certainly improved, in my opinion. 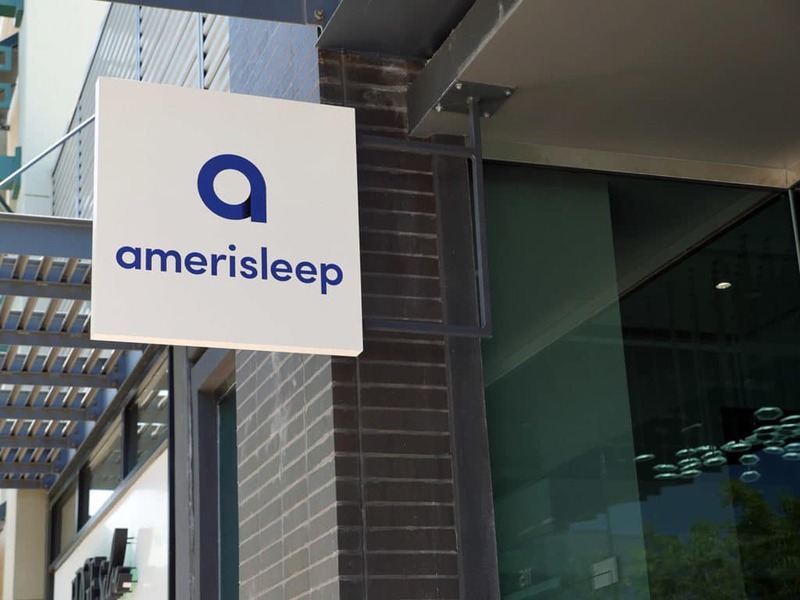 Amerisleep has done a great job redesigning its mattresses and did an even better job opening a showroom that allows sleepers to test these mattresses in a stress-free environment. Over the coming weeks, I will be testing and reviewing each one of Amerisleep’s new mattresses, so be sure to check back and see how each model of the company’s line has changed. All of the new Amerisleep mattresses will be posted here. I’m a back and side sleeper with chronic shoulder and back pain. I’m 5’2″, 205 lbs, and have major struggles with sleeping hot. I tried Nectar, but it was too firm for me, and I found the customer service disheartening. Brooklyn Bedding’s medium is a great firmness for my back but causes my shoulders pain, soft is better for my shoulder but painful for my back. I just tried the Saatva luxury firm and it has such a thin layer of memory foam I feel like I’m sleeping directly on coils themselves and it is intensely painful on my pressure points. The company has great customer service and sent a complimentary memory foam topper, but it is so soft it almost hurts my back more than the mattress on its own. I considered exchanging it for the Loom and Leaf, but the reps advised I try different Tempurpedic models to see how I like the feel. They said the Relaxed Firm is comparable to Tempurpedic Cloud Elite Breeze and the Firm comparable to Tempurpedic Contour Elite Breeze. The Cloud was way too soft and plush, the Contour too firm and intense. My favorites in the store have been the Flex Elite Breeze and Stearns & Foster Hybrid firm. Based on this info, L&L told me they were probably not a good fit for me, so I am just returning the Saatva. I’m really confused and torn about where to go from here. I’ve been considering either the Nest Alexander Hybrid or Signature Select in medium because I love the feel of a quilted cover. Amerisleep’s A3 is strong contender as well because I find the Celliant properties in the cover very intriguing. I’m still open to L&L Relaxed Firm, but I’d want to eliminate the others first before I risk another $100 non-refundable delivery fee. I also been going back and forth between the A2 & A3 for firmness. What would you recommend I try between them? One of the Alexander models? One I haven’t thought of yet? Lol. My poor back is desperate, so any advice is appreciated. Thank you. You once rated one of the Amerisleep’s mattress up to 450 lbs. Which makes it thier new line is rated up to 450 lbs? I would assume the ones that were previously rated for up to 450 pounds will still be rated for up to 450 pounds. Those include the Colonial and the Independence, now the AS4 and AS5.